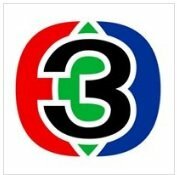 General TV Channel / Thailand Colour Television Channel 3 MCOT, now known as Channel 3 Original was incorporated in 1969 and was officially launched it started began broadcasting on 26 March 1970 at 10:00 Bangkok Time as Thailand first commercial television station. It transmits 24-hours a day, 7 days a week since 1 January 2005. Its broadcasting centre is located on Maleenond Towers, Khlong Toei, Bangkok. Channel 3 is the original broadcast channel to many animated series such as Dogga Doop, Shelldon, Four Angies, etc.